Can you get married over the phone? A marriage is a time for celebration and joy, and cricketer Shoaib Malik will no doubt be eager to put the embarrassing episode of his first marriage far behind him before getting hitched to Indian tennis star Sania Mizra next week. There will be a huge difference between the two marriages – he’ll be present in person for this one, not merely on the end of a telephone line. 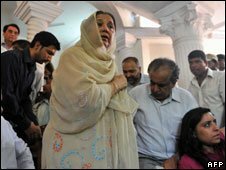 Malik is reported to have conducted an internet and telephone relationship with Ayesha Siddiqui from Hyderabad, finally tying a long-distance knot with her in 2002. According to a story on the front page of the Indian daily newspaper The Hindu, telephone marriage has taken off among Indian Muslims, and in many Muslim countries. “Marriages are made in heaven. But in this age of information technology they are taking place over the net and telephone too,” it says. The Times of India has reported that Muslim clerics are divided over the legitimacy of “phone marriage”, with one arguing that it is not valid because the witnesses need to be present, alongside the bride and groom, to sign the marriage contract. “Telephone nikah (matrimonial contract) is no longer valid, simply because all four parties cannot be at the same place to sign the nikahnama (wedding registration certificate) if the nikah is taking place over the telephone, with the bride and groom in different cities or countries,” Mohammed Khader Ali, Sadar Qazi, chief Qazi of Hyderabad, was quoted as saying. But international lawyer Gabriel Sawma, an authority on Sharia law – including Islamic marriage contracts – argues that telephone marriages, and even internet marriages, could be perfectly legal. “There are so many cases of marriages being conducted in so many different ways – everything is possible within reason,” he told the BBC News website. Both the Malik and Siddiqui families are said to follow the Hanafi school of Islamic tradition. The mahr, he explains, is an amount of money, or any object that has value, that will be given by the groom to the future bride. “Mahr is an obligation on the husband and is a necessary component of any Islamic marriage contract,” said Mr Sawma. In the Hanafi tradition, the mahr is divided into a “muqaddam” (upfront), to be paid at the time of signing of the contract and a muakhar (deferred) to be paid at the time of divorce or death, he explained. He said that the proposal must be clearly expressed and it must be met with a clear acceptance. “Should these three elements occur, the marriage will be considered legal and binding. The contract does not have to be written. It can be verbal and will have the full force of the law under Islamic Sharia,” said Mr Sawma. He drew parallels with the practice of couples entering into a marriage via correspondence, centuries ago. “As long as the letters contained all the requirements and were signed in front of witnesses, this would constitute a marriage contract,” he said. Given the level of interest in the marriage, Shoaib will be no doubt thankful that the divorce was relatively straightforward. In a number of countries – including India – a Muslim man can divorce his wife in a matter of minutes. This has included divorce by mail, over the phone and even via mobile phone text messages. “In the Hanafi jurisprudence, the husband has the right to divorce his wife at any time or in any place at will by simply stating: ‘I divorce you, I divorce you, I divorce you,’ says Mr Sawma. His wife will be immediately divorced if there are at least two male witnesses. The husband is then obligated to give “nafaqa” (alimony) to his wife for three months. Shoaib has apparently agreed to pay 15,000 rupees (about $337; £220) to Ayesha for three months. 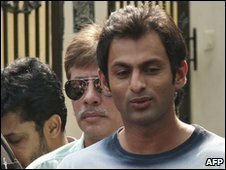 According to many reports, Shoaib’s divorce means that he is now free to marry Sania next week. But technically, they could have got married anyway, as Islam allows a man to take four wives as long as he is able to meet all their needs. Shari’a is defined by Muslim scholars as “the way” Muslims should live by. It is a “path” like “shiraa’” (i.e. sailing ship.) It is derived from the sacred texts of Islam: The Quran and the Sunnah. 3- Isma’ili, they are found in Kufah (Iraq), Afghanistan, Pakistan, Uzbekistan, India, Yemen, China and Saudi Arabia click reference.